A must-have, or just another gimmick? 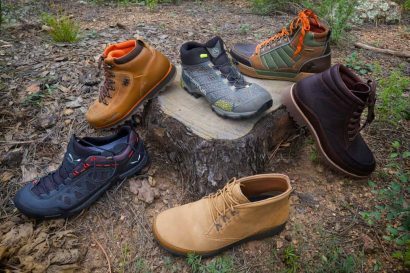 Long-term review of Pick-Pocket Proof clothing. I’ll admit, when I was asked six months ago to test the latest pick-pocket-proof clothing, I was skeptical. I’ve spent a lot of time in third-world or developing markets, where pickpockets are rampant, and I started this test assuming the clothes would either be ineffective, or impractically heavy and bulky. 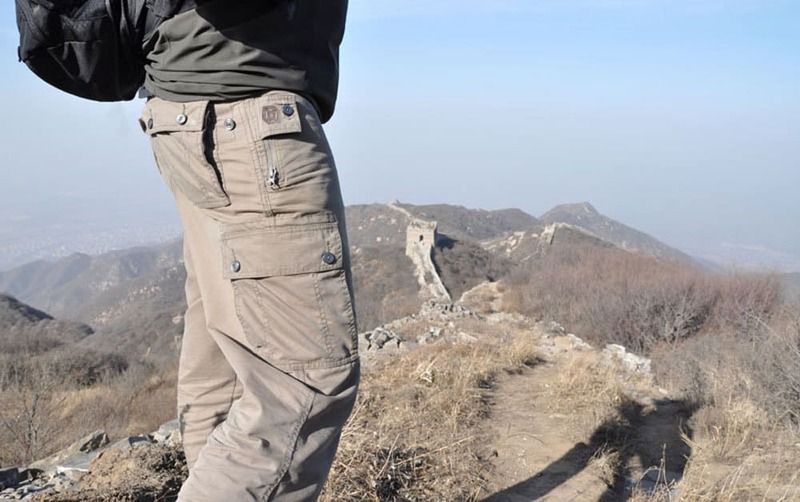 I was envisioning silly gimmicks like the “hidden” passport pocket in the TAD Overlanding shirt, (which is sewn into the back of the shirt, so that you need to be a contortionist to get it when you need it, and has no way to secure the item once it’s inside). Instead, I am happy to report that the pieces I tested from Clothing Arts (C.A.) have a lot more thought put into them. I like to travel as light as possible. This means clothing that can be used in casual and business-casual situations, that is appropriate for a range of weather conditions, and is easy to wash and dry in the field. I selected a set of convertible pants (in grey) and two Ultimate Travel Shirts, one in grey and one in white. 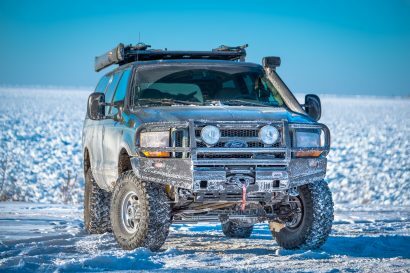 Suitably attired, I set out on a short trip on the Trans-America Trail. This would give me a good mix of hotel stays, camping, restaurants, field cooking, meeting people, and lying in the dirt with my camera. It would also show me how practical the clothing would be to actually use daily. My EDC (Every Day Carry) consists of a pocketknife, sunglasses, keys, passport, wallet and phone. On a photography trip like this I would be carrying a camera battery, memory cards, and often a lens-cap in my pockets as well. 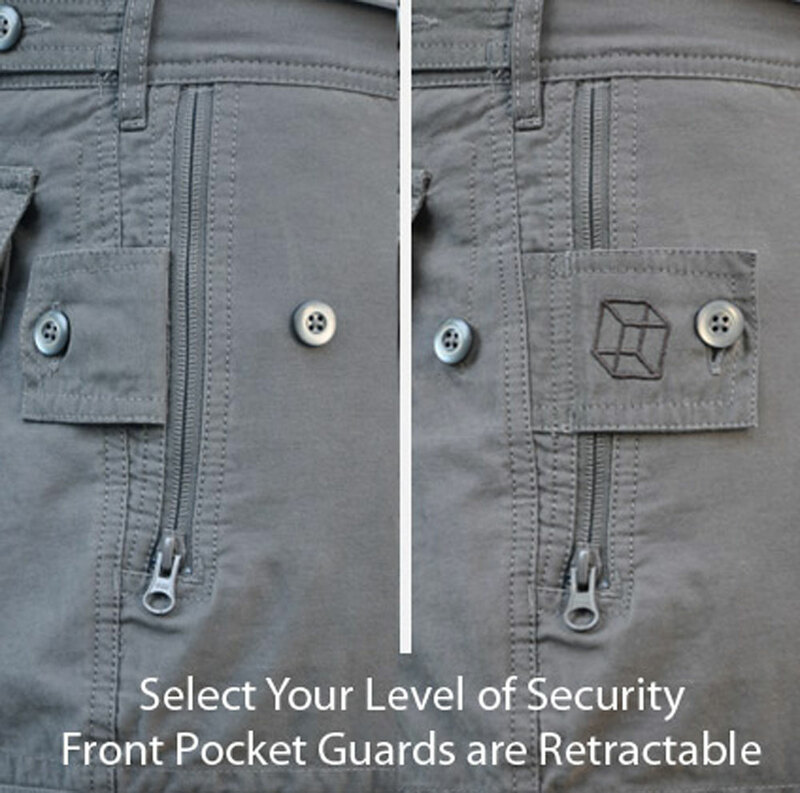 There is no shortage of pockets in the P-Cubed (Pick-Pocket Proof) lineup. 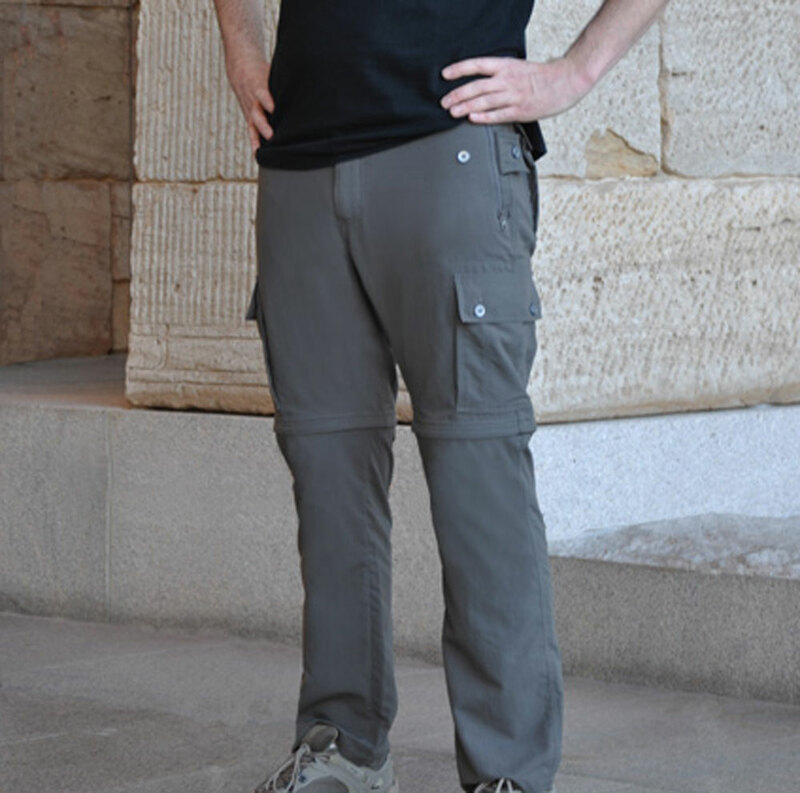 The pants alone have enough for everything I need, and each shirt has an additional 4 pockets. The pockets are adequately sized, and easy to access. C.A. provide security in three ways: 1. Camouflage – Most pockets contain a secondary, hidden pocket behind it. The second pocket is accessed via the main pocket, but through a zippered slit that a would-be thief hopefully wouldn’t know to look for. 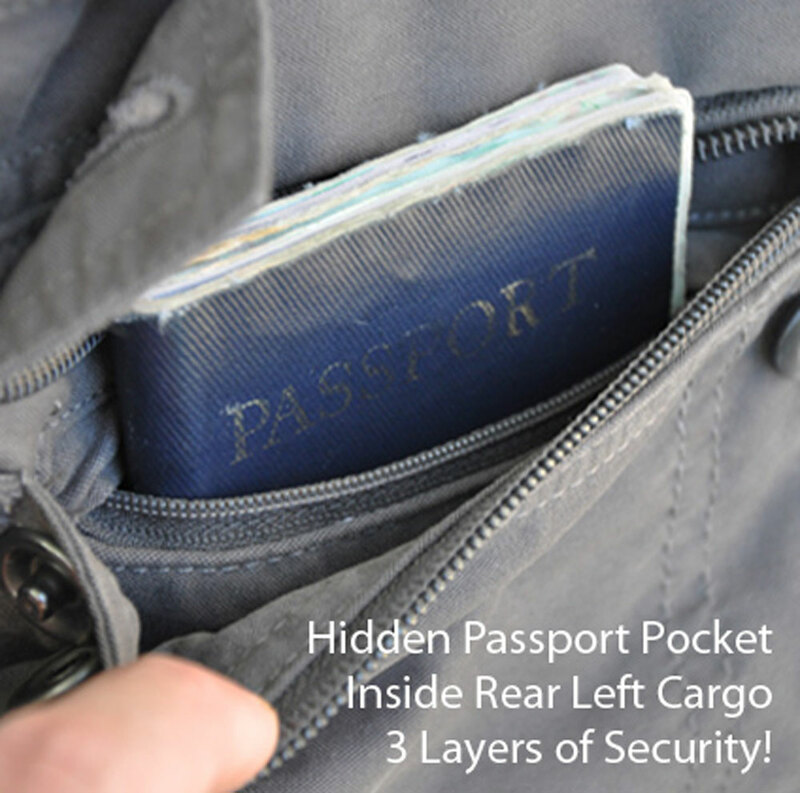 The hidden-zip pockets on the shirt are exactly sized for a passport. 2. Fastener redundancy – Pockets have buttons over buttons, (or buttons over zips, etc.) so that a thief has to open two layers of fasteners to access the contents. Statistically, according to C.A. data, most thieves will give up after the first fastener, as the chance of being caught dramatically increases. 3. Separation of layers – even if a thief uses a blade to slice through the pocket, they will be careful not to cut too deep. Cutting your flesh will alert you (I hope) to the thief’s actions. 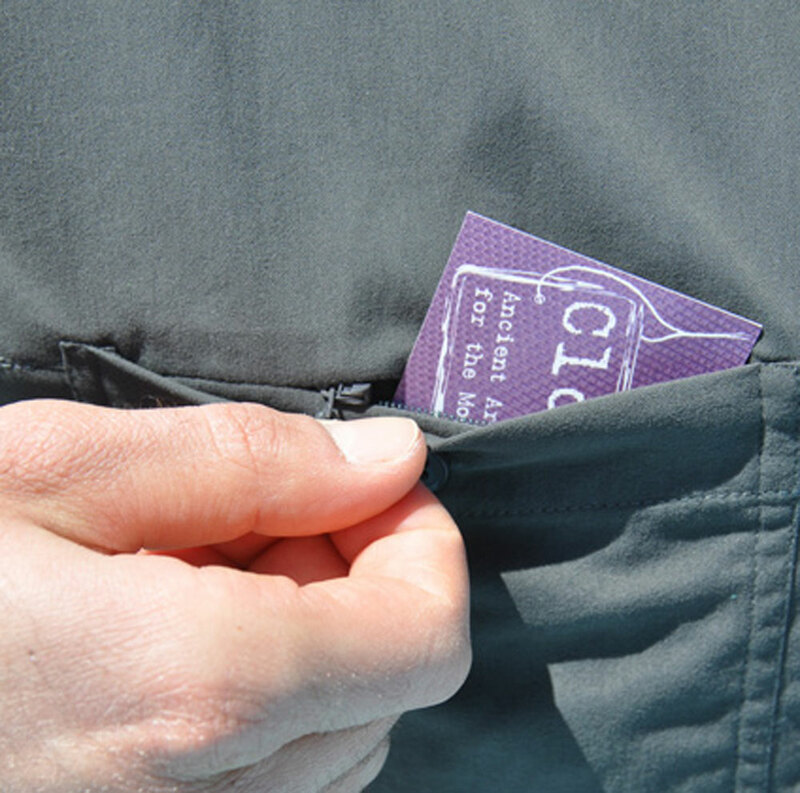 By using separate layers of fabric that “slide” against each other, the P-cubed lineup keeps the contents of interior pockets safe, even if the outer layer is breached. As important as security, is the choice of fabric. An uncomfortable garment will be left behind on those forays where it is needed the most. And clothes that can’t be easily washed and reused on the trail (linen, heavy cotton, etc) won’t get taken on a second trip. Clothing Arts uses a proprietary synthetic they refer to as “Nature-Like Nylon”. I was impressed by its cotton-like feel – light and breathable. When I lay in the dust and dirt in the white shirt to get a shot of an LR4 driving through the bull-dust, I admit I was intentionally pushing the fabric past what I felt it was designed for. Yet remarkably, most of the dust and dirt brushed off when I stood up. That night I washed the shirt in a sink with a capful of generic hotel shampoo, rinsed it out, and hung it to dry on a coat hanger before I went to dinner. When I came back to my room a couple of hours later, the shirt was dry and relatively unwrinkled. The following morning I put the white shirt back on, and within 5 minutes any remaining wrinkles were gone. It looked so good that one of the other photographers asked how many of those white shirts I had brought on the trip, and he initially didn’t believe me when I explained it was the same one from the previous day. The cut on both pants and shirts is athletic, but not skinny. I liked the fact that the shirt looked equally good buttoned-up with the sleeves rolled down for a dinner or interview, as it did with the sleeves rolled up as we cruised along and chopped branches on the trail. 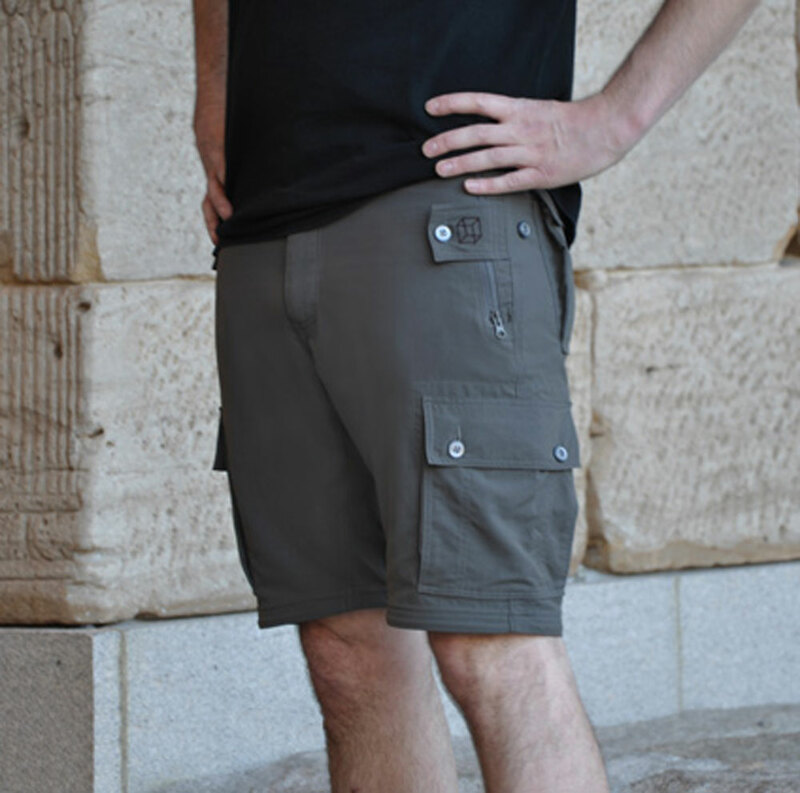 The convertible pants have a button adjustment at the waist, so they can be loose and comfortable for daily use, but if you need them to double as swim shorts, you can snug them up by an inch, and leave your nice leather belt on the beach, while ensuring everything stays where it should and they don’t end up around your ankles. A discrete red thread is sewn into the zipper-end on both sections of one leg. This makes it much easier to determine which bottom-section attaches to which leg when you zip them back on in the evenings as the air gets chilly. The crotch has a diamond gusset for easy movement. Overall I was impressed, enough that I have taken these clothes on a dozen more trips since getting them, in addition to wearing them around the house and the office. The shirts especially won me over, and are now my go-to travel shirts. The pants look and feel good, but have a slight tendency to “pill” or “bobble” a little bit in high-wear areas after 6 months of continuous use. Not enough to be visible, but just noticeable when you run a hand over them. I imagine passing an iron over them at low heat will fix the issue before it becomes a problem. With the cold weather coming in the Northern Hemisphere, and many people planning a trip to somewhere with cold drinks, warm breezes, and nimble fingers, it wouldn’t hurt to throw one of these in the suitcase.